As we drove, we perused the Hema for our options. Our conundrum was simple, we didn’t want to backtrack, anywhere if possible. It felt like we were at the wrong end of Zeka Spur Track, but were still undecided when Howitt Hut appeared. 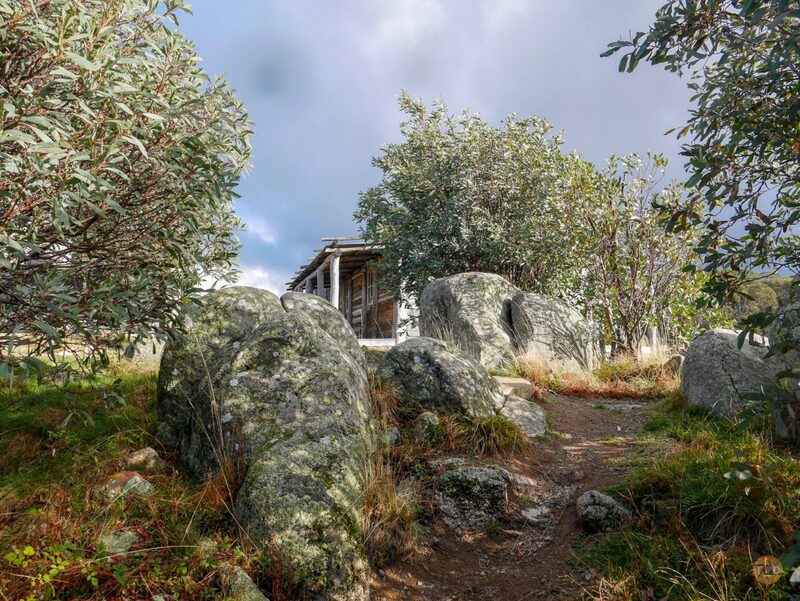 Fenced off from vehicles but completely exposed to the wide open elements of its peaked location, Howitt Hut stood tall, the tallest hut for us so far. Camping was limited to an equally exposed, worn out area nearby. 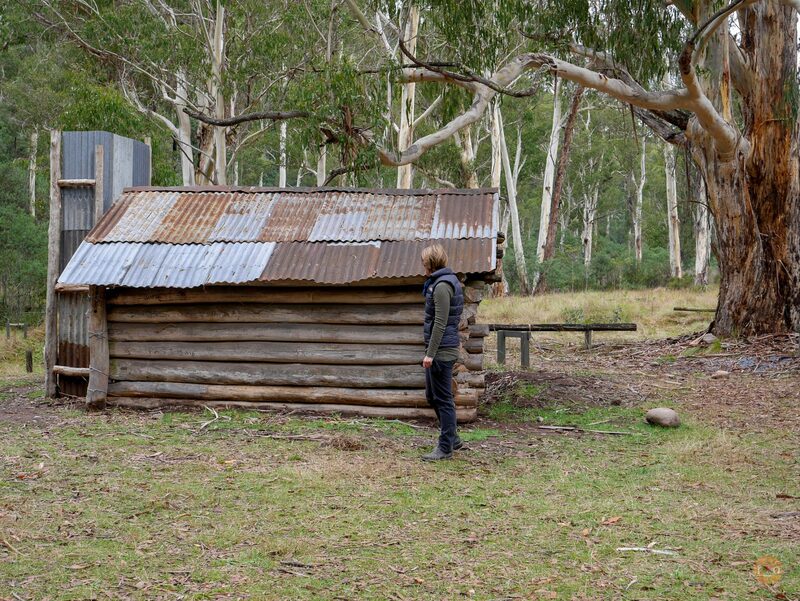 Exploring the area around us on the Hema, I spotted Lovicks Hut. 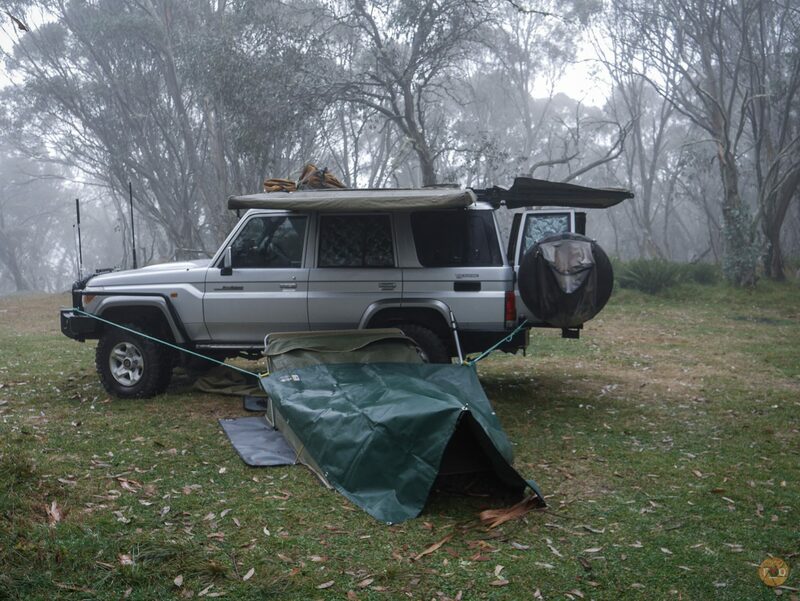 I had heard of its misty grandeur in the hills, on the Bluff Track. 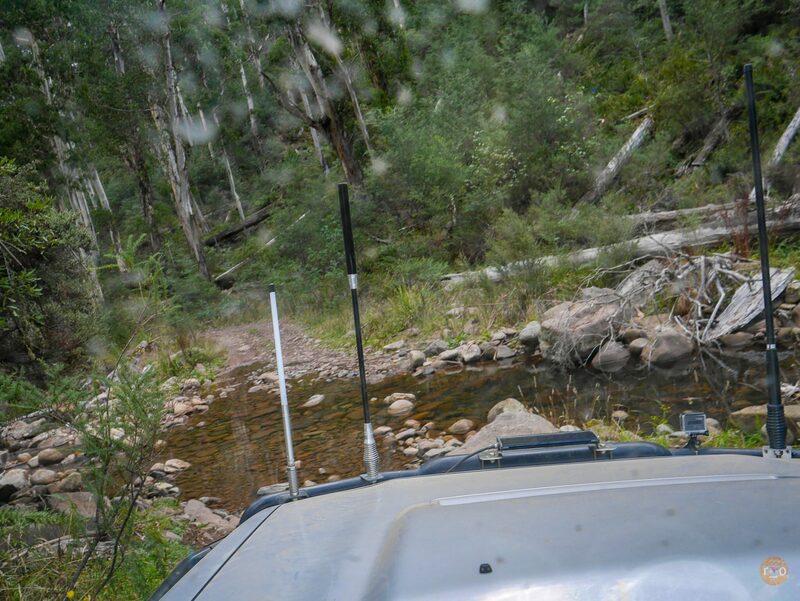 All we had to do was aim the LandCruiser at the King Billy Track. Decided. We spied a caravan camped in an open camping area just before the wooden sign that warned us we were commencing the 4WD Only King Billy Track. A quick bit of scrolling on the iPad warned us of a few Black Diamond sections of the Track but hey, it couldn’t be any scarier than Billy Goats, could it? 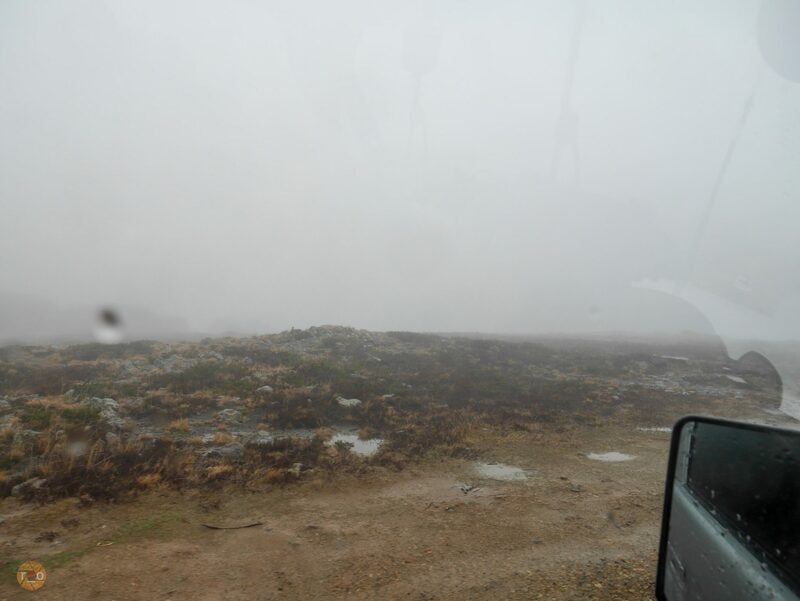 The weather was definitely turning now, the gathering clouds were heavier and the wind was whipping about spitefully. It was darker, even with the sun piercing through. Either we started the King Billy now, or camped nearby and risk it being impassable tomorrow. King Billy invites you down, around, and down some more. The descent was decorated with tall straight timber and granite boulders, the trail itself mostly blue. The switchbacks, or hairpins are plentiful, but today I am unafraid. 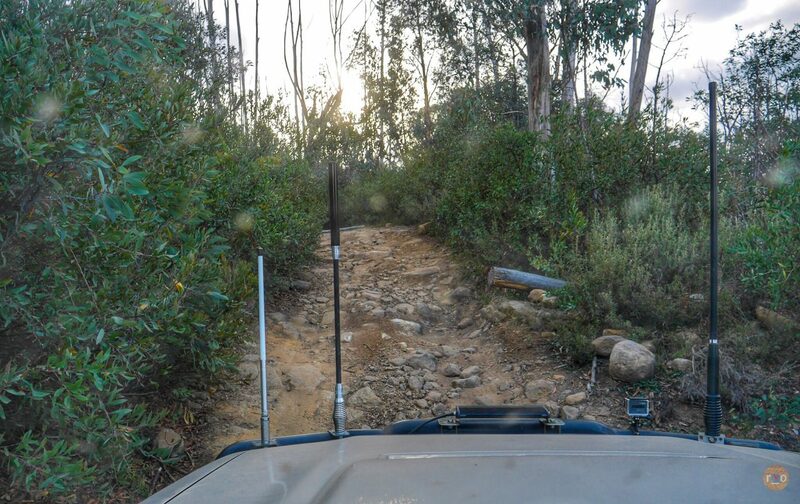 I stop to walk one, but coming down it proves childs play for the LandCruiser and we kept on going, for more of the same. All that gravel crunching, twisting and turning, takes us into the darker creases of the hills. 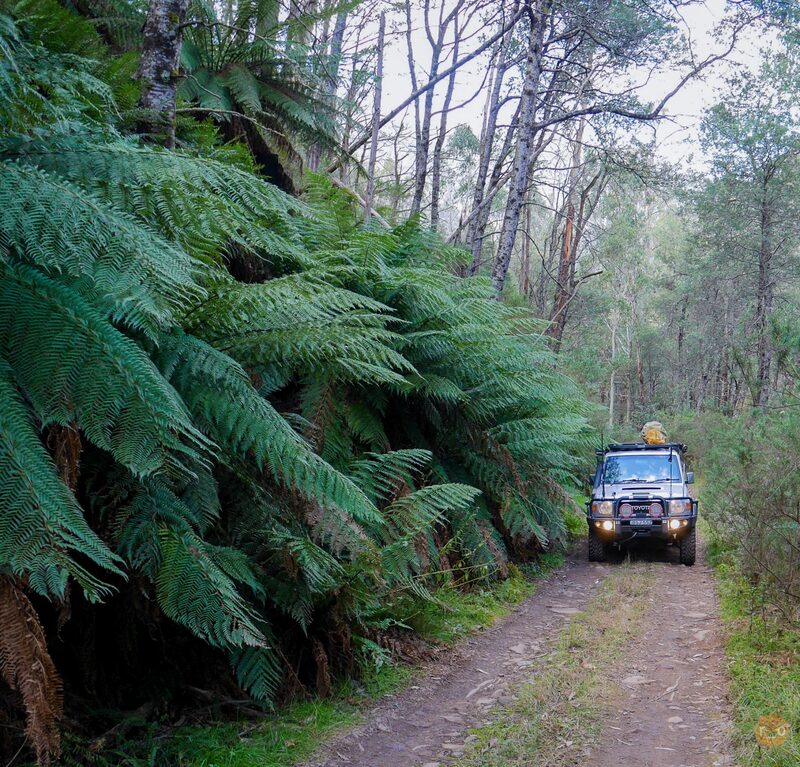 Where the ferns are huge, the treefalls are dramatic and the sky seems all that much further away. We’re on a high altitude forest floor of giants. Old giants. The track is perfection. Just enough mud, rock and water crossing to keep the pace in slow, single digits. Down here, out of the cloud and wind – my vision of the rich, over-saturated forest is only obscured by the shallow windscreen. The tyres and suspension work together and twist and turn and absorb the rocks in slow motion. Walking pace. The swag swinging side to side as we articulate. 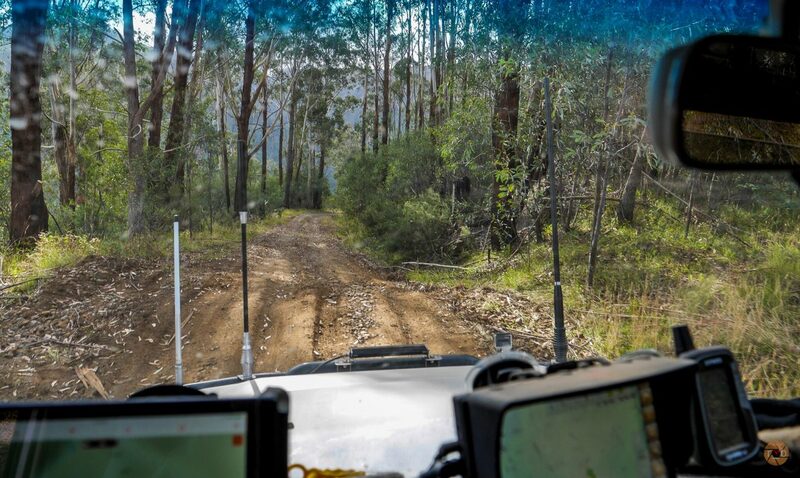 We came across a Prado, who gruffly warns us that the track ‘gets rough’. Excellent, I am loving it. His small tyres and low clearance, perhaps – not so much. He passed us, returning to his caravan. Crawling across bumbling streams, we started to climb and the tall deadwood are back, guarding the path. The track became narrow, overgrown but dry as we climb. Until we crested at a lookout. We come to a junction and turn on to the Bluff Track, the weather up here is fitting. Now stormy dark, the wind is wild and howling. Its trying to rain, big fat drops, assaulting the windscreen. Mixing with the dust. With each squall, I realise, its carrying the rain and throwing it at us. As it’s quiet and almost rainfree until another follows it. I put on the headlights but they only make it feel darker. Bluff Track is absolutely breath taking. I am not sure if it’s the gathering storm or the sudden altitude, but I couldn’t stop staring. The track, a rich clay brown. The undergrowth, void but for knee-high, course, golden grass. The trees – ancient, gnarled and beautiful. 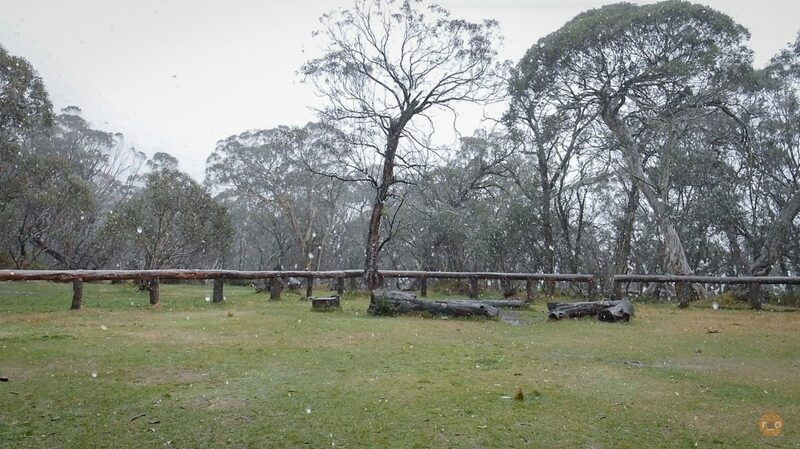 Snow Gums. Their arms outstretched, barely moving under the force of the gale. We wound our way through them, the track is slick now. All my tree gazing pays off when I spot a particularly amazing specimen, and yank on the handbrake. Opening the door was a challenge but I just had to get out and see. 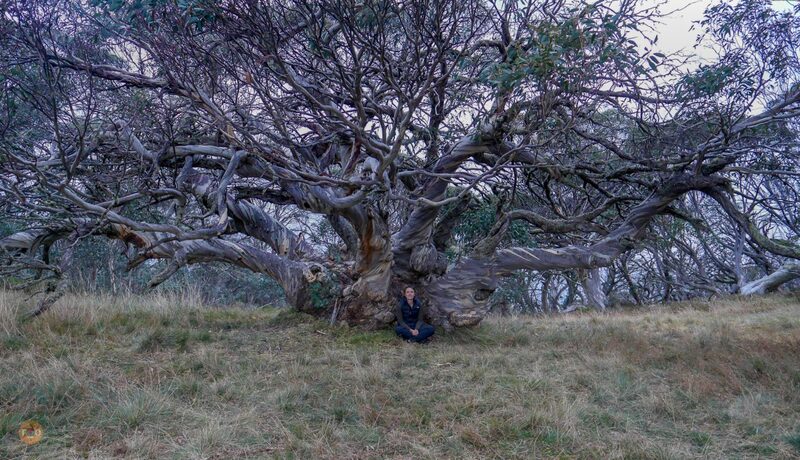 The most ancient and wondrous tree I have ever seen. Perched on a hill away from the track, unsigned but I was sure this was the revered, ancient Snow Gum I had read mention of, somewhere. David struggled to get all its glory in frame, but we had a few moments, sharing the violent air around us. I read later that, despite me calling him a She, he is actually named King Billy. Centuries old. The weather, now fierce, has charged us with finding camp before the light disappears for good. Wipers drumming on the windscreen, driving lights making the clay in front glow red. The clay is interrupted with purple stony erosion mounds to keep our descent as slow as possible. 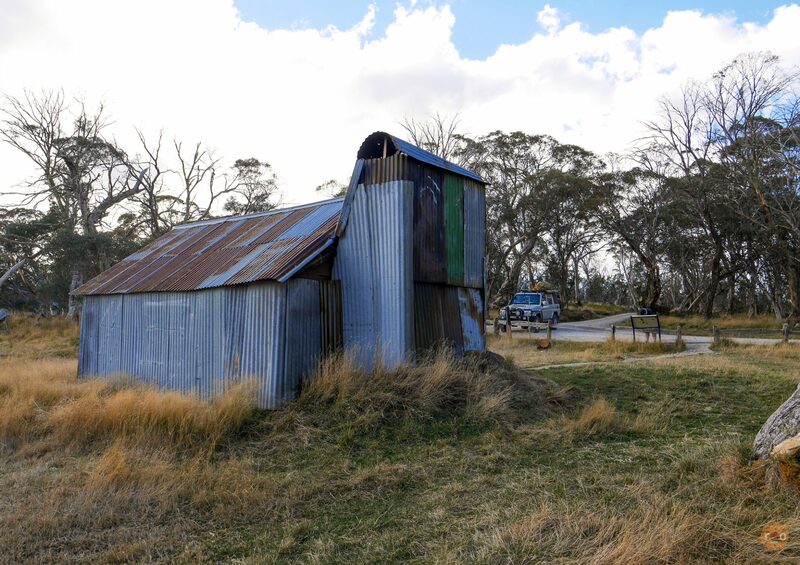 Lovicks Hut, a mansion with a fenced yard looms into view, black in the low light. There were several hiking tents in the yard and the floating pricks of light are hiker headlamps. We spotted a familiar HiLux parked at the Hut. In the last throws of the premature dusk – we set up the swag on the somewhat quieter side of the peak and venture into the Hut. The volume of the wind is countered with the frenzy of a dozen school age hikers, all cooking dinner and hyped up. Like cats or horses maybe, because of the wind. Our fellow explorers have their Oztent pitched in the Hut’s annex. This Hut is a viking’s hall by comparison to our earlier finds. There is bench space, a fireplace the size of a queen bed and a huge stack of lumber to feed it. Excited to see familiar faces, we talk about the track and the Huts and the glorious weather. Beginning to settle now, we’re hungry, so I bring the pantry and stove into the hut and cook up an extra spicy, chicken breast curry. The steam from my breathing obscured my view. Despite the countless bodies sharing the Hut, and its fire. The temperature had plummeted. Arcing around the giant fire in our camping chairs, we ate our variety of dinners, eyes adjusting to the gloom. The wind intermittently sending smoke and soot back into the Hut. Like the coming and going of the squalls, the kids all disappeared into their tents. Blue, yellow and green domes glowing out on the soggy lawn. Their leaders, from a local, prestigious school, filled us in on their adventure and plans for tomorrow, likely a short hike to Bluff Hut for rescue, as the weather was looking too dangerous. Muscle stretching and paperwork complete, they too retired and we enjoyed the fire fairly late by camping standards, about 10pm before dashing out to the swag. Waking up, to possibly one of the coldest mornings. Howling wind and bitterly cold sleet was quite the alpine alarm clock. Too cold outside of the swag, and only feeling warmer submerged deep under the wool blankets. We had the swag zipped up tight agains the horizontal rain through the night so we had generated a lot of condensation. Ice cold water beading on the roof of the swag, occasionally finding exposed skin to drip on. My night time handiwork with the canvas tarp looked interesting in the frigid light of morning. Feeling the cold had soaked through to my bones, we opted out of the sleet and brewed our morning coffee in the hut. The hikers were long gone. Later that morning, the weather unchanged, we took a moment during a lull in the sleet and dragged the swag up and under the awning of the Hut. There was no way we were driving anywhere and another night at the Hut sounded perfect. There was fresh alpine sleet melting off of the iron roof into our buckets, a toilet nearby and plenty of firewood to keep the smokey furnace alive. All we had to do was wait it out. Which is what we did, spending the day cooking, eating, exchanging life stories, camping tales. Occasionally venturing outside and watching phone and camera batteries drop to 0% in minutes. 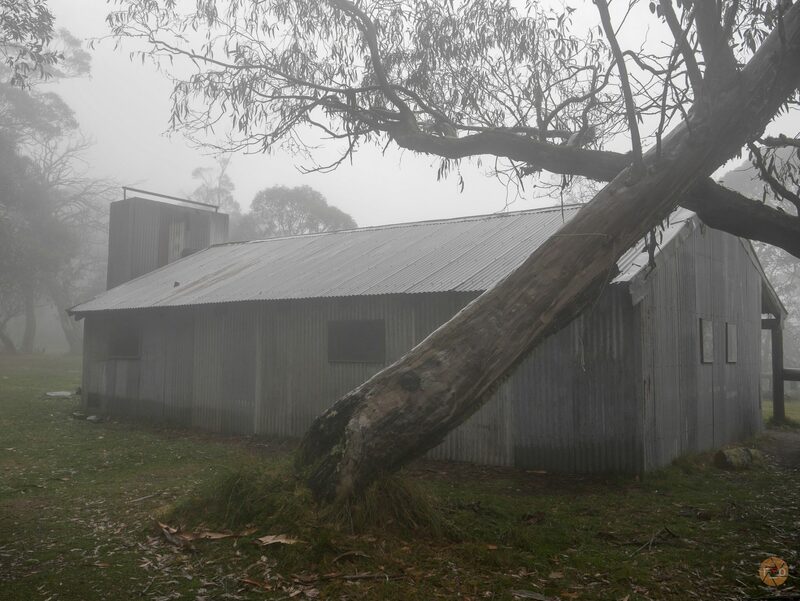 Rugged up in all of my warmest layers, I was still blinded by the fog of my breath, inside the hut. Around 2pm I checked the temperature gauge on the LandCruiser, 0degrees Celsius. We were being treated to a proper alpine Autumn. I cooked a few mini loaves of damper, heated a tin of spaghetti on the fire, umpteen coffee brews and tea bags. 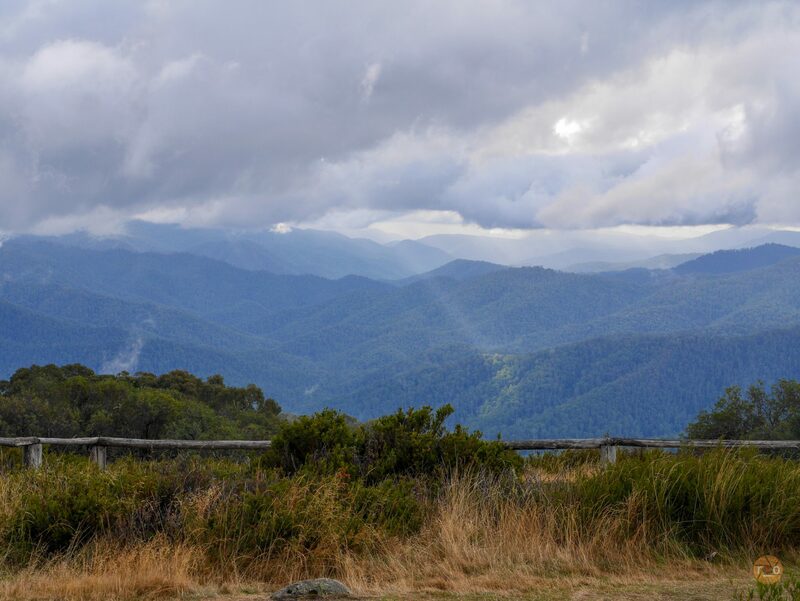 We had visitors, a large group of retirees on their annual Alpine reunion, but the weather had turned them around there at Lovicks and they only chatted whilst they organised their return drive down Bluff Track. David had left his shoes out in the weather over night so we had them roasting in the hearth, he was getting around in thongs, like a local. The rest of us were in all of our layers, hands in pockets until absolutely necessary, thoroughly loving every freezing minute. As the short day grew dark the Hut filled with the smell of roasting pork and bannock. The temperature dropped but the storm surge seemed abated. By camper’s midnight, aka 9pm, we were ready for bed. Our sheltered swag under the awning was fairly dry inside and now sheltered from the weather on two sides. Without the howling wind, we slept soundly. The following morning found us still enveloped in a thick fog, but quiet and dripping. 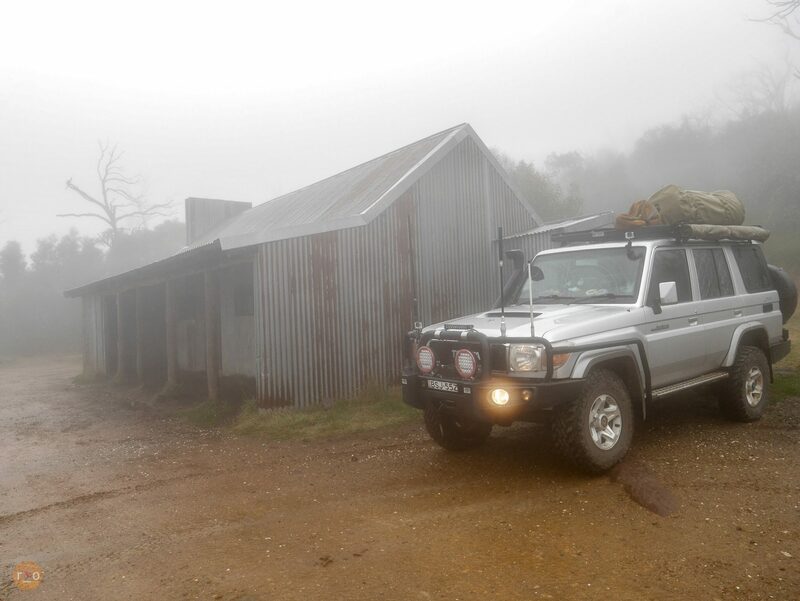 After breakfast we commenced packing up the LandCruiser – having mostly emptied into the Hut we had called home. Today seemed colder in its stillness, but the activity helped warm our joints. We were all coughing, sooty and tired from shivering, so a warm air-conditioned drive sounded pretty good. 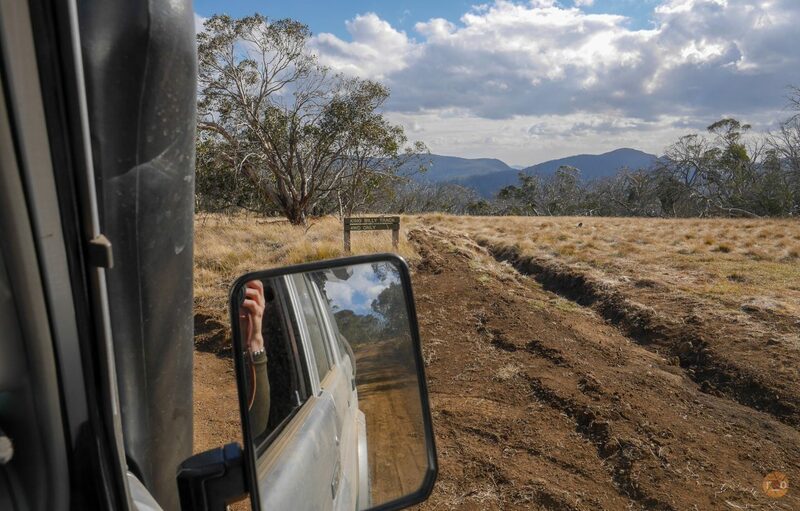 With the hut empty and tidied up for its next guest, we set out on the slippery clay Bluff Track. It wasn’t long at all when we found Bluff Hut. 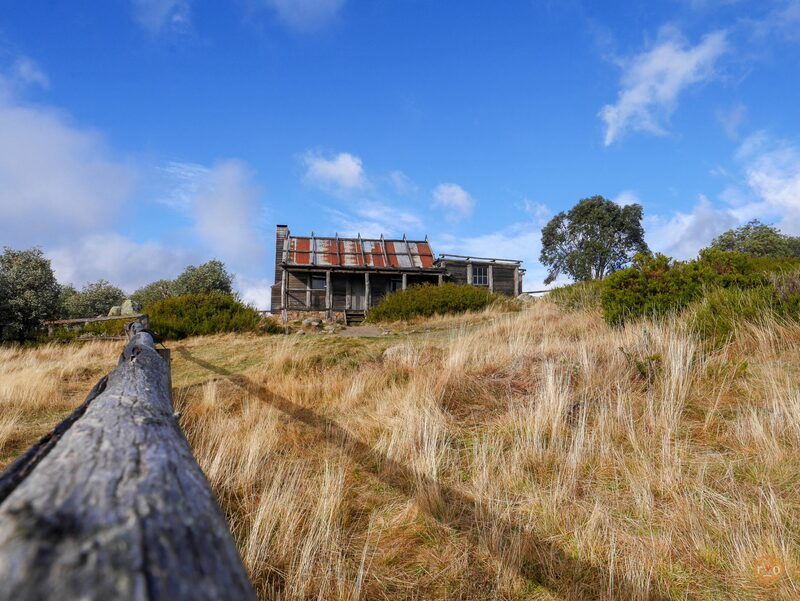 We were joined by a couple of seasoned explorers and got chatting about the Hut’s history, the surrounding track conditions and other non-High Country travel we had all enjoyed. 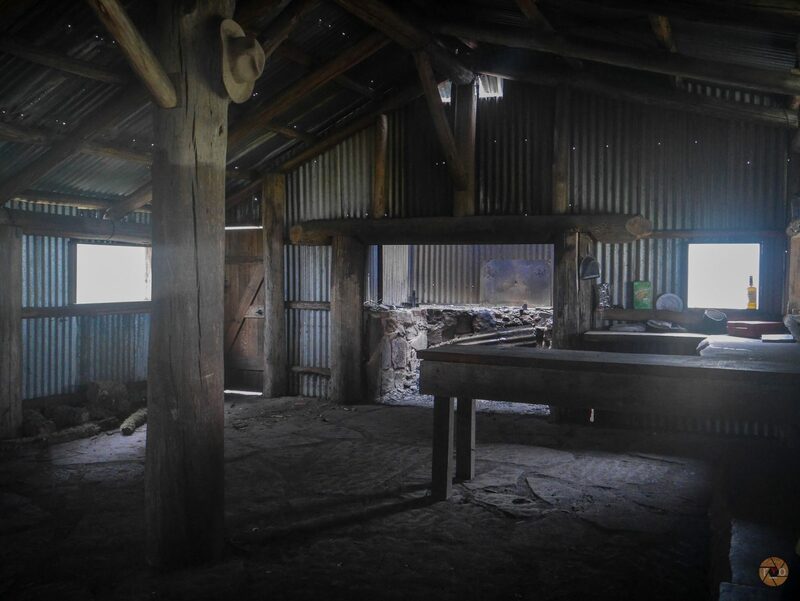 Bluff Hut used to be two storey, but since its rebuild, it was a well designed single storey with a mammoth fireplace, complete with pot stand, benches and a table. A hunter had passed by Lovicks the night before telling us how crowded Bluff Hut was during the storm, it was small but wind tight and would have happily kept its many guests warm. It was here, after shivering and chatting, we decided to make our way to Bindaree and Craig’s Hut. We bidded farewell to our comrades, as they were making their way slowly West to eventually head to South Australia. We zigged and zagged along the Bluff Track, passing one other vehicle. 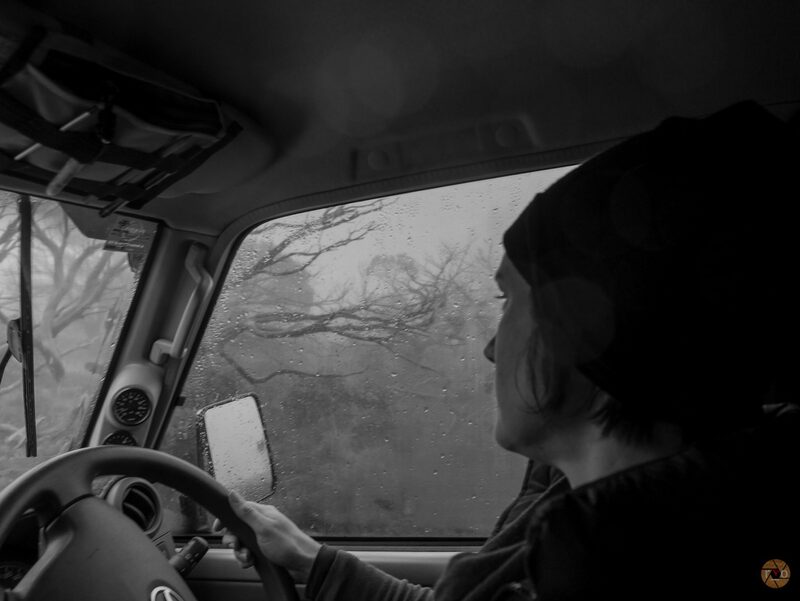 We each folded our mirrors in and squeezed past. The environment changed, along the Bluff Link Road the growth old and less scarred from fire. Dripping from the wet weather, everything was washed, green and earthy. Bindaree Hut is a squat little shelter, resting beside a raging, clear stream that we negotiated to gain access. It sports a modern brick fireplace but its traditional height is Hobbit like, especially amongst the tall growth of the region. We enjoyed sandwiches and espresso with the micro hut. The camping area was green and had a toilet, but was particularly soggy. 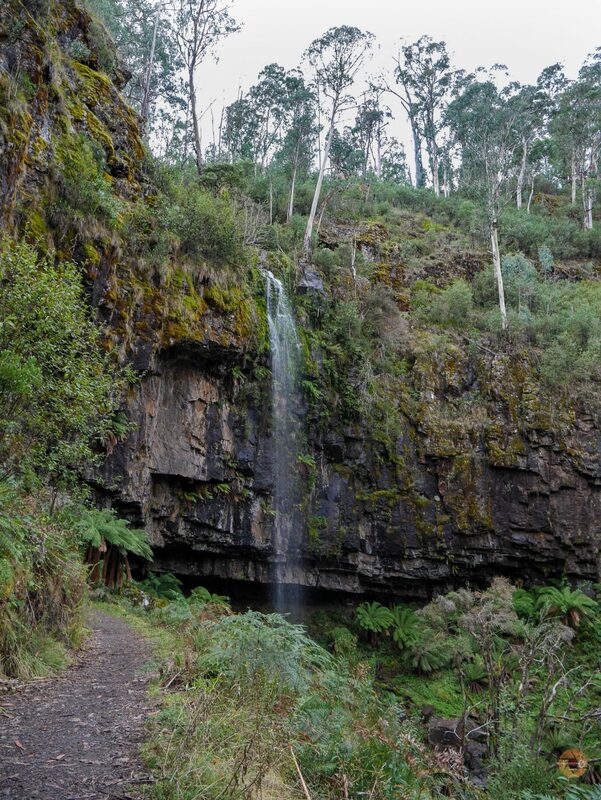 Climbing the adjourning hill, we found Bindaree Falls carpark, full. Hesitantly, we walked with our camera up the narrow path, rainforest growth keeping close. The path follows the stream, climbing until you gain first glimpse of the falls themselves, narrow but very tall. Bursting out from an exposed perch, glary today under the high cloud. We lingered along the track, giving the visitors a chance to enjoy the base of the falls a while before they all began their return trip. A huge convoy, family by the look of them. 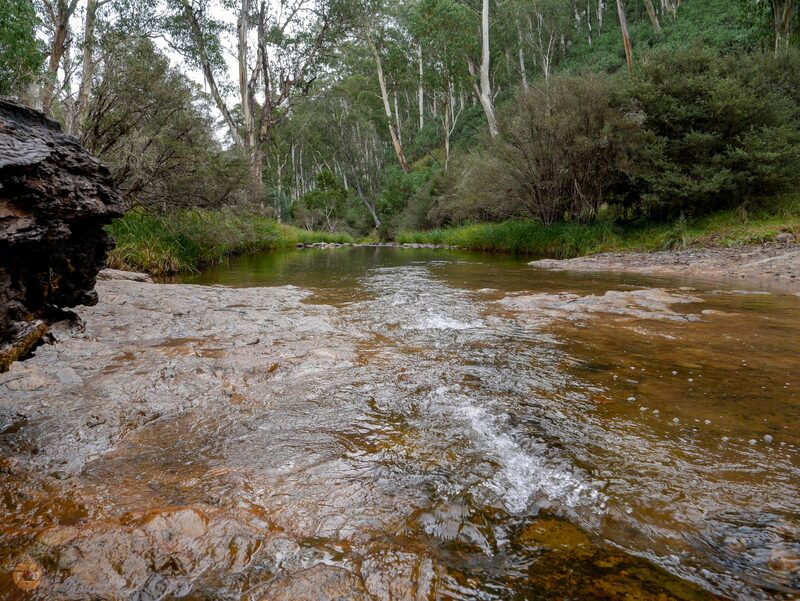 Having the falls to ourself, we took some photos and enjoyed the contrast of wonder this corner of the High Country had given us. Huge mossy boulders, glistening ferns, and the steady roar of an alpine waterfall. Back at the LandCruiser, track closures granted us limited directions to Craigs Hut, so we pressed onwards, and upwards. Winding about the dark and rich forest, the fog finally clearing. The temperature remained in single digits. Fog still obscuring our view, we made it to the Monument Track. A closed sign was resting, off the side, not exactly blocking the track. Disappointed but erring on the side of caution, given the late date in Autumn, we heeded the sign and, continued on the Circuit Road. Until we came across a tree. We tried to winch it out of the way, but the winch, now confirmed to be well past ‘final notice’, was misbehaving. 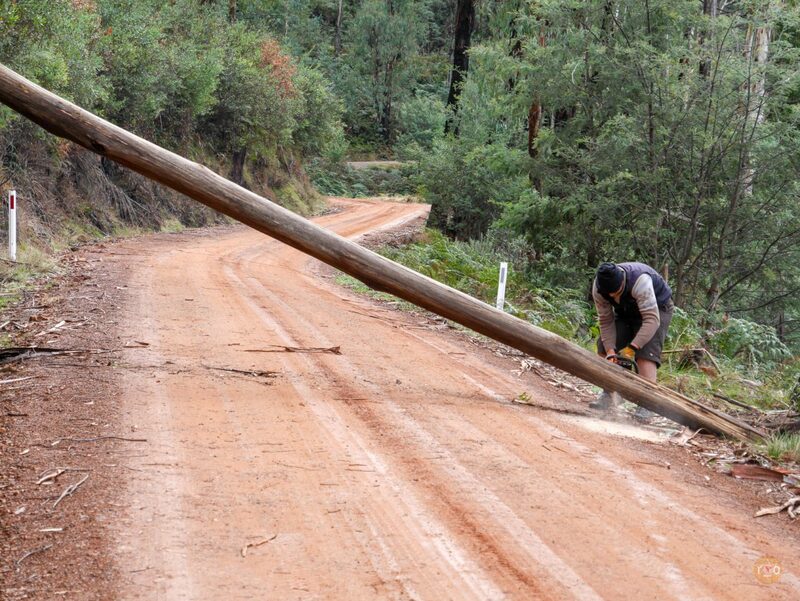 Instead, the trusted Stihl Woodboss took care of it, and we were on our way again. Eventually finding a signed carpark, we were adding layers for the walk when some mud-stricken four wheel drives came roaring up the track. 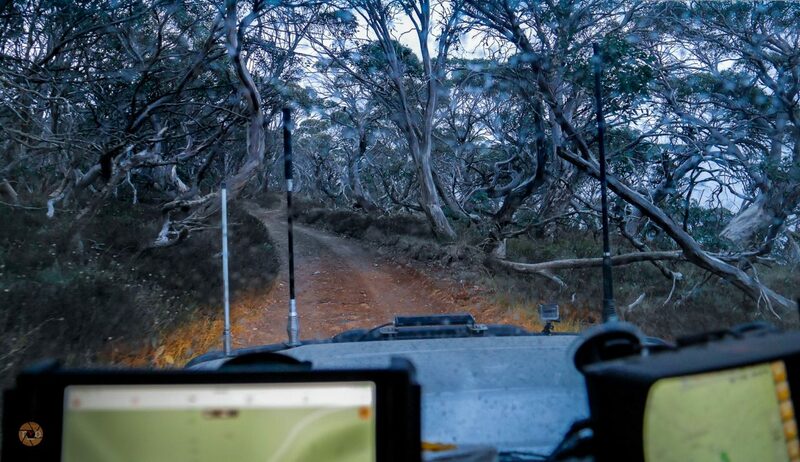 We assumed they were travelling along the closed route, but with Victorian plates, likely local and far more knowledgeable about the trails than us. We hiked, on foot up the steep narrow track, the air growing colder as we climbed. We followed hoof prints in the mud, picturesque given the famed hut we were visiting. Returning to open alpine hills with bleached deadwood, the view unfolded. Before long, puffing cold white steam, we made it to the grassy knoll, below the pretty gated property of Craig’s Hut. Standing grand and sprawled, the boulders set about it, straight out of a story. The sun appeared for a moment, for a photo. 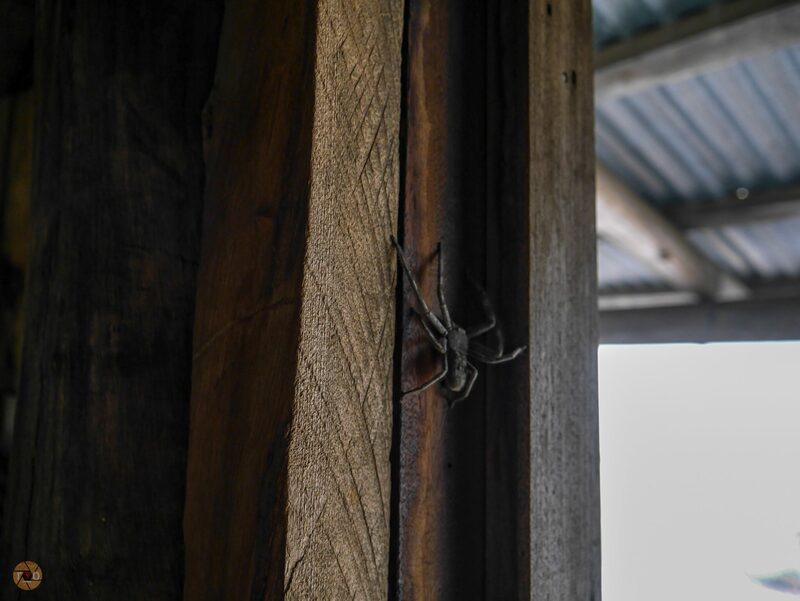 Inside, less rustic or dusty – this Hut sported a timber floor and heavily gated fireplace to prevent its use. The romance really, was from outside. Its view, the icing on the proverbial cake. More visitors appeared, from the opposite side, we walked to check it out and found the main access, two wheel drive vehicles, a campsite and signage. We had ascended from the back? 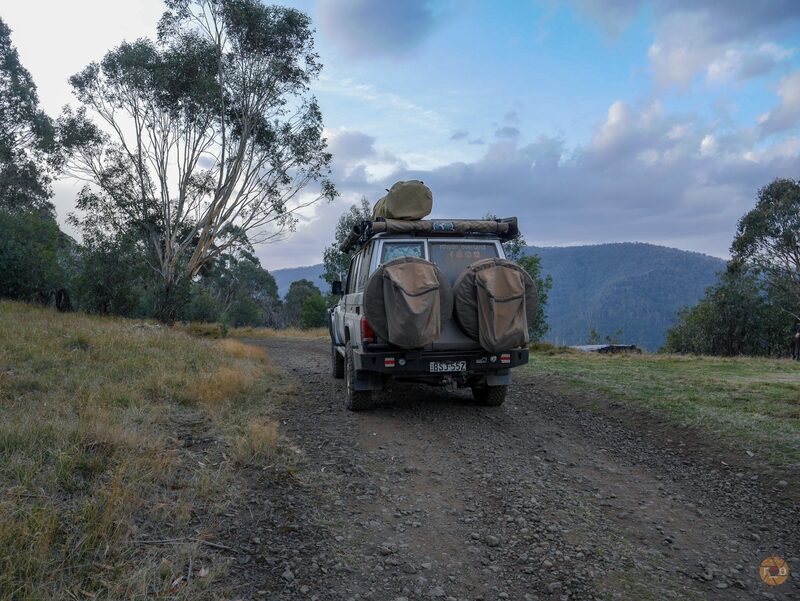 We returned to the LandCruiser and followed the road, which did meet around the other side. We started our descent down Clear Hills Track, keen for an alternative route. Only to be greeted with a Road Closure sign again. 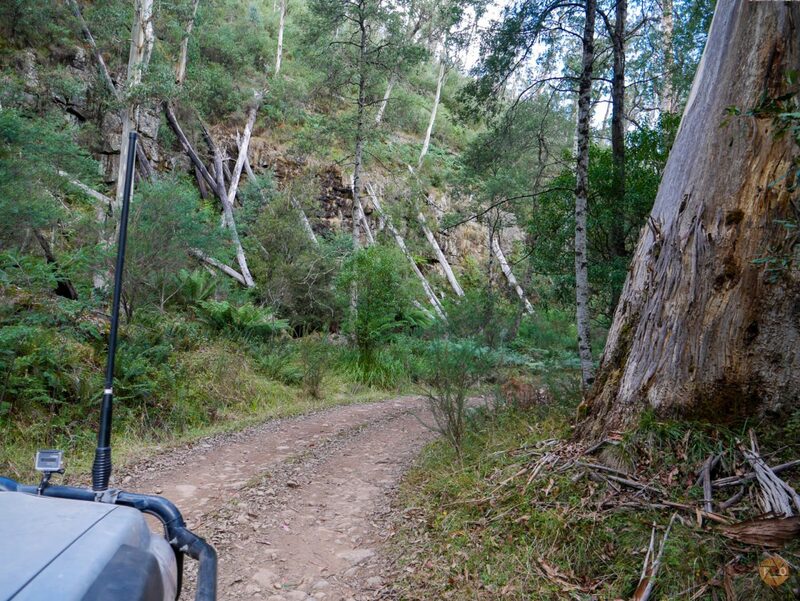 Negotiating a turn amongst the trees, we backtracked the narrow, wet track to the main road.